Richard Dawkins' and Yan Wong's recently re-issued (2016) popular science book, The Ancestor's Tale, is loosely modelled on Chaucer's Canterbury Tales. 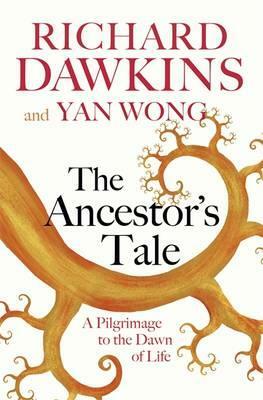 Instead of pilgrims journeying to Canterbury, Dawkin's and Wong's protagonists are living species, journeying back through evolutionary time. In real time, individual species diverged and speciated. But in the backwards time of The Ancestor's Tale, separate species start the journey apart, in the present, and "converge" together as they descend into the past. Humans "meet" the chimpanzee and the bonobo around 6 million years ago. We all continue back in time together, rendezvousing with gorillas another million years earlier. The time doubles before the next convergence, with orangutans, at 14 million years ago. The authors take their readers back and back and back. We eventually meet rodents and rabbits at 75 million years, amphibians at 340 million years, lungfish shortly after 400 million years. Insects, spiders, worms, snails and other protostomes are all more closely related to one another than to us, so on their own journey they have already converged. We meet them as one huge scuttling, crawling, sliding band at around 590 million years ago. The common ancestor - the "concestor" in backwards time - which we share with the protostomes, was probably worm-like, segmented, with a mouth at the front, and probably had eyes. Their reversal of time is designed to exorcise the "conceit of hindsight", in which all of evolution is seen as something inevitably progressing towards the human and in which we lazily describe one species as "more evolved" than another, for example. The Ancestor's Tale is a fascinating overview of all life on earth. Our small hope is that the Ancestor's Trail will help to illustrate the tree of life by symbolically walking the journey back to the origin of life.